We all know how our cats have their own funny and quirky personalities. Some cats pounce more than others, while other cats jump in boxes. And, then, some cats have to paw their water and stir it all around before they even drink it! Why, in fact, do our cats’ paw at their water bowl? Your cat may use her paw to find where the water is in the bowl. The close up vision of cats is much weaker than their long distance vision so when he or she is right in front of the water dish, she might not see the water level. Therefore, by checking where the water starts and moving it will cause the water to ripple and splash. Once your kitty is satisfied where the water is, then he or she will commence. Cats like to play. Moving the water with a paw may be one way a kitty keeps herself entertained. If your cat likes to do this, you might think of investing in a pet water fountain. That way, you can keep your cat entertained and you won’t have to clean up all the water on the kitchen floor! If your cat regularly drinks from the sink, then he or she will expect water to move. So when water is still in a dish, it can be unsettling for you kitty who then feels the need to give it a whack or a push. Whiskers are sensitive, and cats don’t like to squish them. 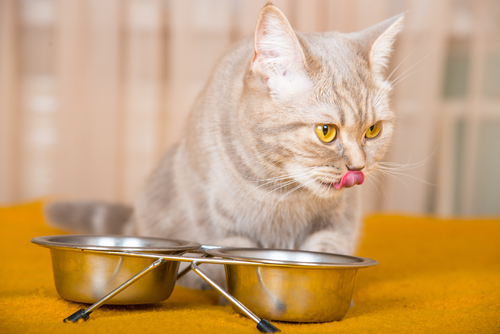 If the water bowl has a small diameter and the cat’s whiskers touch the sides when she tries to get a drink, she may opt to dip water out with her paw instead. A flat, shallow dish for water might encourage her to use her tongue. Cats are sensitive to changes in routine. If another pet joins your home or if you place her in a new environment, she may display signs of stress. Or maybe you moved the water bowl and your kitty is pawing it is so she can keep an eye out for danger. If the water level is different each day, your cat might want to avoid putting their face in just in case it’s higher than they expected. Or if it’s too deep, your cat might feel unsafe dipping his head into the unknown, so he will deliberately spill the water to drink from the known surface of the floor.